AzBaja.com, Home of the VW Baja Bug -:- Baja Forums -:- VW Volkswagen Bug, Baja, Bus, Sandrail and Thing -:- VW Volkswagen & Baja Bug General Discussion -:- $%! @# oil leak! 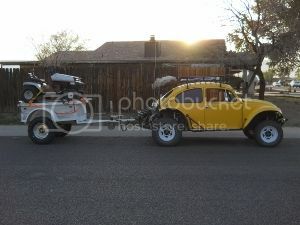 Baja Forums -:- VW Volkswagen Bug, Baja, Bus, Sandrail and Thing -:- VW Volkswagen & Baja Bug General Discussion -:- $%! @# oil leak! Post subject: $%! @# oil leak! During the last river run, I ran out of oil on the freeway while going back home. Dummy light started blinking....pulled over and refilled ~2qts. I checked the oil before I left phx in the morning and it was full, so in about 5 hours, ran it dry. Smacks forehead for not checking it more often. I thought it was leaking around the oil pump, so I pulled it and made it all new again. But then it started leaking again! Argh, a nice steady leak. I could see (think) that it was coming out somewhere between the pully seal and top of oil pump, right on the case half. With other maintenance, I changed the plugs, but also did a compression check...not good results. 60, 30, 30, 30....How the hell is this thing still running?!?! I imagine I did some damage. Oil filter was clean, no shavings. Engine seems like it has no low end torque, high end OK. Notice some smoke coming out of #4 upon spool down. So what should i do? Full rebuild, buy/swap a rebuild ("dreaming" put a Subaru in ) Suggestions for getting a rebuilt, where to look? there are other people on the forum that have actually put a Subaru in their car and turned out quite nicely. I'm sure that they will chime in on the subject. As for your car I'm guessing that with such low compression that it had a bunch of blow by and on a Volkswagen there is no seal on a stock VW pulley just a reverse thread to pull the oil back in the engine and any thing else on, or around the pulley! If your blow by was great enpugh that it was just blowing all your oil out of the engine! Bummer to hear about it but you can't kill a A/C VW lol! Good luck on wich ever route you choose! 2 other "Good blocks" and the one I cared the least about was the best one. Thanks for the flash back..!!! Crazy but it worked! I too have used gear oil to get some oil pressure on some of my vehicals (when I was younger lol!). After I moved down here I discovered motor honey from STP. I remember one time when I first started going on runs with you guys, I crossed a river and the pulley sucked up a whole bunch of water! I didn't carry enough oil for a oil change! I believe it was either Paul or Tom told me to take off my oil filler cap and drive it easy. OMG the steam coming out looked like an old steam train, but by the time we arrived at camp there was no more steam and I swear to you the oil was amber once again! I bet every body here has a get by story or two! I was there that time... we had a few blocks fill up with water .. we just pull the plug until we start to see oil and plug it up and run it until we burned off the water... its called a "motor flush" shops charge for this ..
show the customer all that gunk in the motor. tell them for $78.62 you can flush there motor . Put a few cups of water in the oil. let the oil and water mix to this white goop. the white goop steams loose all the grime in the motor and traps it in the oil filter. when it stops steeming .. the oil looks new again. Change the oil filter. what destroys the motor is rush. don't let it rust. Defenatly! also Change that oil! stock vw has no oil filter, just a screen and only holds about 2 1/2 quarts. VW Volkswagen & Baja Bug General Discussion The "Where does your VW leak from" thread!